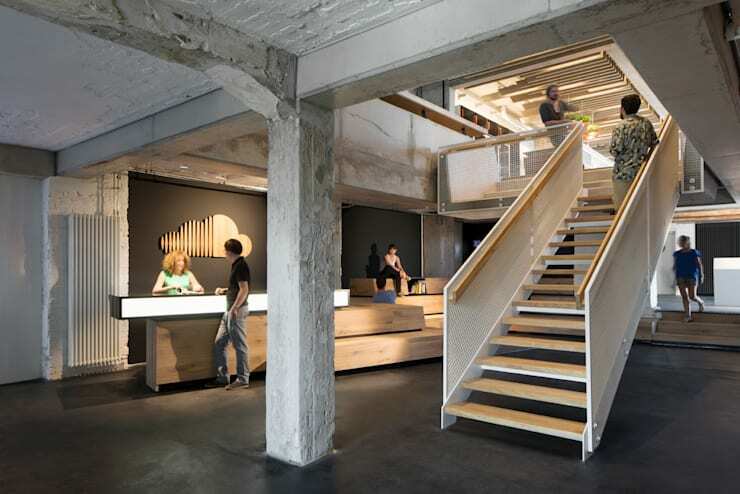 Today on homify, we're showcasing something truly special, having been lucky enough to get a glimpse at the Berlin premises of internationally renowned platform for musical exchange, SoundCloud. Designed by Berlin architecture firm, Kinzo, this office space presents a modern transformation of an old brewery close to the former Berlin Wall. The building has been transformed both inside and out, with the industrial air of the construction augmented by additions exuding a powerful sense of modern style. While SoundCloud currently subsumes three levels of the office complex, the entire building has been renovated to serve as a future incubator for up-and-coming start-ups, and could potentially accommodate up to 350 desks. 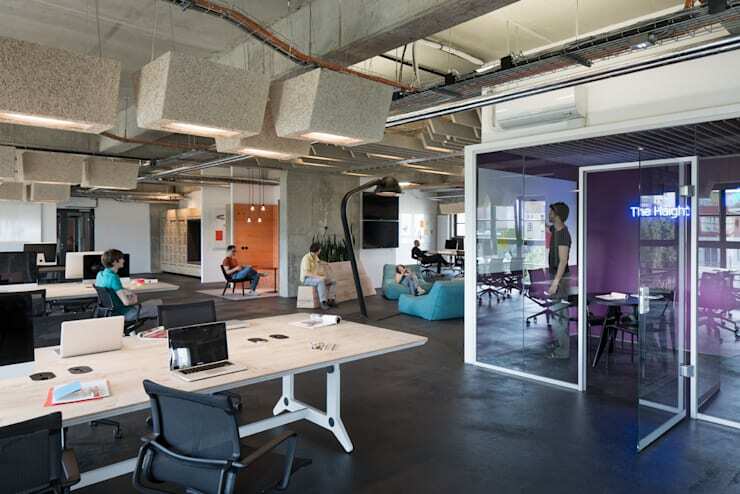 The interior of the SoundCloud office is immediately inviting, with its decoration emitting a sense of relaxed style. The industrial edge of the former brewery has been retained, with its concrete beams and brick walls still visible, but a range of fixtures and furnishings in pale timber have also been included, which soften the space with their modern aesthetic. The office comprise myriad locales in which staff can interact and engage, with inspiration and productivity encouraged through the creation of a casual and inclusive atmosphere. Those in need of seclusion or rest have also been accommodated, with multiple small spaces and alcoves included to calm restless or stressed minds, and a games room laying in wait to get the blood pumping again. This stylish office space lends insight into the machinations of an incredibly successful and innovative enterprise, and provides plenty of ideas on how to create a playful, relaxed and productive environment within your home or business. Take a tour below and tell us what you think! This office building exudes both style and intrigue, with its beautiful blend of history and modernity immediately catching the eye. 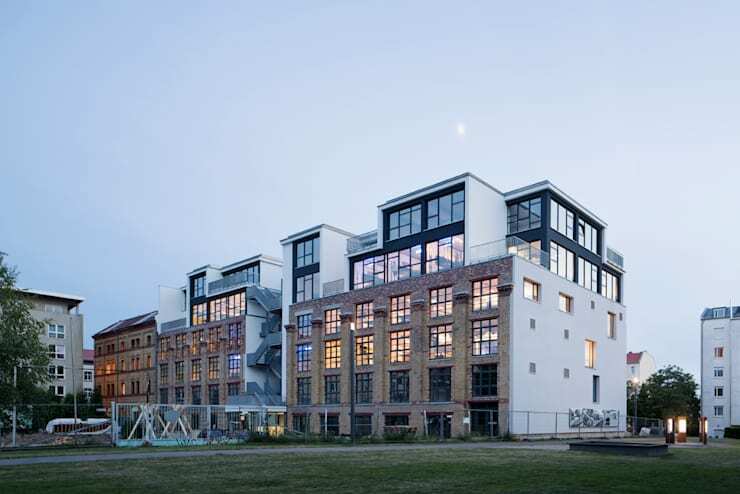 The exterior displays a traditional, Berlin building in industrial style, with its original, brick facade laying the foundation for a raft of modern additions. White rendering decorates the sides of the building, while a series of boxes in white and dark grey crown the structure, adding lofty new levels with a modern edge. Once inside and we're embraced by a wonderfully open space, with the rough texture of its concrete pillar, brick walls and flowing, polished concrete floors infusing the office with an industrial edge. Modern finishes balance the aesthetic, with the reception desk constructed of pale timber for a warm and welcoming feel, and its black backdrop adding depth to the space. Moving upstairs and we're greeted by a well-lit, modern setting with a relaxed atmosphere. This floor houses the office canteen, with food and drink available for enjoyment at a series of picnic tables by the office's expansive windows. Hanging plants refresh the space with natural colour, while a series of concrete slats stream overhead, providing a sculptural, modern take on the building's industrial beginnings. The office space combines multitude elements designed to inspire creativity and productivity, with flowing, communal desks, small meeting rooms framed in glass, and even a range of relaxing alcoves populated by contemporary sofas. 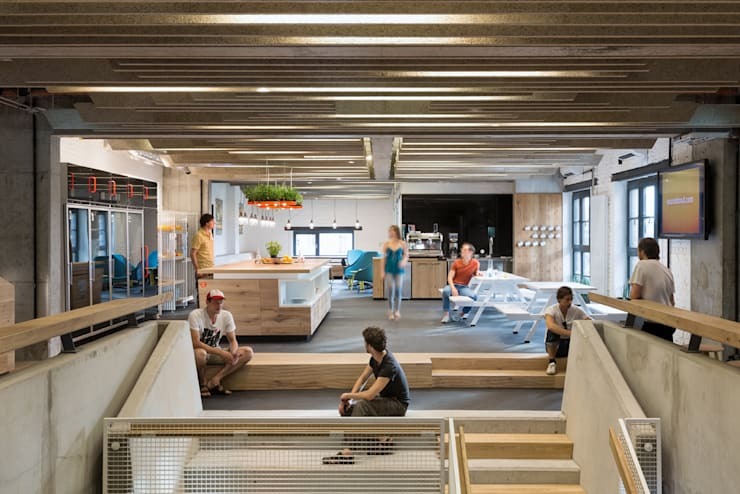 The layout of this office adheres to the modern, Western approach to human resources, in which interaction and transparency amongst all members of the staff pool encouraged. For times when more secluded brainstorming sessions are necessary, the office also includes large meeting rooms such as that seen here. This room retains a casual and relaxed air through the use of a lengthy, geometric sofa, in keeping with the ambition to encourage individual contributions to collective creativity and decision-making. Framing the sofa is a desk space, suitable to accommodate those needing to work on their computers. While the workplace is ordinarily a hive of productivity, it's sometimes necessary to take a step back from daily tasks for a moment of reflection or relaxation. As a result the office includes multiple areas to which staff can retire to unwind and clear their heads, such as this timber alcove, with a snug, upholstered interior. This cleverly-designed space also provides functional storage for staff belongings, with a range of drawers and lockers included, and a place to hang clothes seen around the corner. 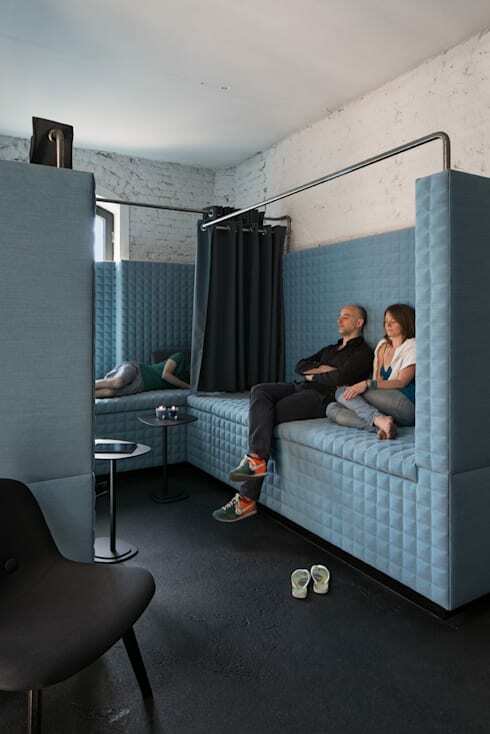 In the event that staff feel like a more substantial rest, this cushioned alcove has been constructed, with its cool, blue tones creating a soothing atmosphere for a restful nap. Curtains section each small space for privacy, while sunlight filters through a large windows, softening and warming the area. 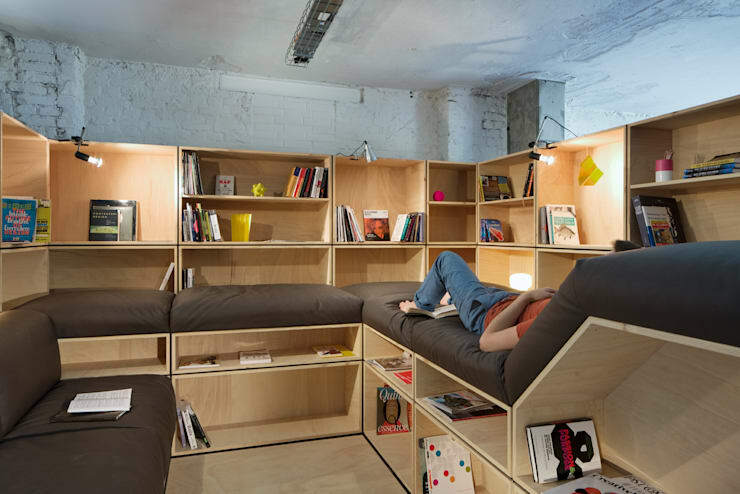 If the sleeping alcove wasn't enough, the office also includes a contemporary library, waiting to be filled with inspiring titles, to which staff can retire and rejuvenate their creativity. Constructed of pale timber, with voluminous, grey cushions lining a geometric lounge suite, the space is cosy, comfortable and secluded. 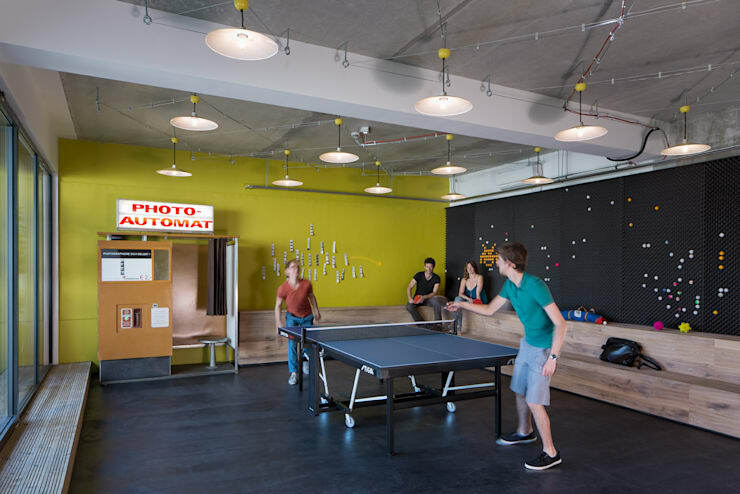 For those feeling a little more energetic, or wishing to celebrate the end of an arduous workday or week, the office also includes a fabulous games room, where staff can get together and have some fun playing ping pong, take some crazy snaps in the photo booth or just unwind with a casual chat. Lofty ceilings frame the room, with an array of expansive windows and contemporary lights providing illumination. Black walls and flooring are offset by a feature wall of bright green, which adds another lively, vibrant element to this playful space. Intrigued by the various design elements seen throughout this amazing office? Then take a look at this guide on How the house forms and shapes affect our subconscious for some ideas on how to incorporate similar features in your home! Would like to include any of the design elements featured here in your workplace? Tell us which ones below!